"Whiskey is for drinking, water is for fighting over"
The magnificent Mekong River is facing big changes. Southeast Asia is a booming world region and it's hunger for energy is huge. To meet the growing need for energy there are plans to build a great number of dams in south China's Yunnan province, as well as in Laos and Cambodia; Milton Osborne, a long-term observer of Southeast Asia's development and river expert numbers 77 planned dams in Laos alone, partially on the main Mekong River, partially placed on tributaries. The first seven dams at the upper Mekong in China are already operating. More are under construction or planned there. Now Laos is building a first dam at Sanyabury (Xayabury) in the middle section of the Mekong. In an April 2014 statement the Laotian government announced the construction of this megadam by 23% for completed. In late 2013 there were news about the (secret) construction of a second dam in Laos at Don Sahong (4000 Islands). Additionally a dam construction in Cambodia at Stung Treng started. What does that mean for the river, it's ecology and the people living around? Huge Mekong is not only one of the biggest rivers in the world and by distance the largest in Southeast Asia, but also absolutely unique. Sourcing from the Tibetian plateau, crossing the six countries Tibet/China, Burma, Laos, Thailand, Cambodia and Vietnam, after 4,800km it reaches the South China Sea at the Vietnamese shore. The Chinese part of the river is called the upper Mekong or Lancang (Jiang) River, the part from Burma/Laos on downwards is the middle section of the river; the huge Mekong Delta starts at the Cambodian capital Phnom Penh. First it's biodiversity is extremely high; in fact it's hosting the second richest biodiversity of all the rivers in the world. Only the Amazon river in South America hosts a higher biodiversity. The Mekong is home to almost 1,000 freshwater fish species. Among them are more species of giant fish than in any other river in the world. The most famous one is the Giant Catfish, which grows up to 3 meters. Second, the Mekong is the largest source of inland fishery in the world. It feeds some 65 million people. In Cambodia, Mekong fish supplies 80 % of the protein nourishment of the whole population. Third, the percentage of migratory fish is extremely high. Between 40 to 70 percent of the fish, including some of the biggest freshwater fish in the world, are migratory. Since the Mekong below China is still a free flowing river and until recently not very industrialized, yet there haven't many extinctions been observed. Even some very big fish like the dogeating catfish, though critically endangered, still managed to survive. The Giant Catfish is maybe still living in the river between Chiang Khong and Chiang Saen, but that's not sure; a few couples of Irrawaddy Dolphins still survived south of the 4000 Islands of Si Phan Don and at Kratie in Cambodia. But the Mekong is under threat. It is already overfished. A growing population increases the pressure on the river's wildlife year for year. For the Laotian and Cambodian populations there is a 100% population growth expected within the next 20 years. Traffic and water pollution is rising. Urbanization takes place. But a cascade of dozends of dams on the main river alone will harm the ecology dramatically. When this article was published first in September 2011, it was focussed on the Sanyabury dam in Laos. Since the rapid development brings up news all the time, the page will be updated from time to time. The Sanyabury dam and it's description is in many points characteristically for all the dams on the Mekong. The newer dam projects are pointed out in their particularities in the lower part of this page, as the Don Sahong Dam, the Pak Beng Dam and other projects. The river dams at the upper Mekong in China's Yunnan province have a clear impact on the river's flow, water level and silt transportation. They have a smaller impact on the biodiversity of the middle and lower sections of the river. A dam in the middle section means a great harm to the fish species and the wildlife. 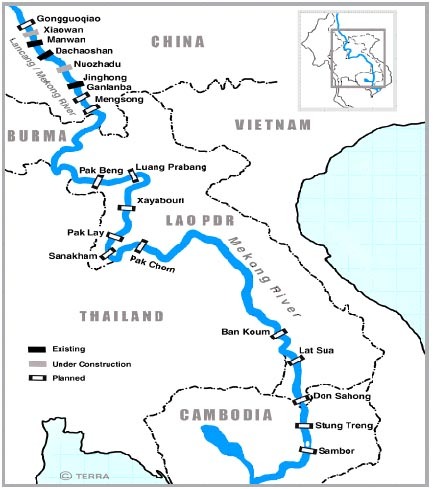 Existing, planned and under construction dams on the course of the Mekong River. There are many, many more dams already operating, under construction or planned on the countless tributaries of the grand river. Laos is a land-locked country in Southeast Asia, wich suffered heavily under the American aggression in the Second Indochina War (1964-75). It's always counted as the poorest country in the world region. Apart from natural resources as minerals in the mountains and agricultural products Laos has nothing to sell on the world market to make a trade income in hard currency to cover the import of industrial products it can not substitute itself. The energy hunger of it's quite far developed neighbour Thailand triggered the plan to produce and export electricity. Plans to build a dam some 30 km east of the small and remote provincial capital of Sanyabury (also: Xayabury) in Laos date back at least to 2007. The Sanyabury dam project is a large dam, under global standards among the 300 biggest in the world. The construction started (secretly) at 2011, the expected opening date will be in 2019. The building site got covered by armed forces, witnesses from outside couldn't approach the site regularly. Some figures of the dam are: the expected costs were estimated 3,5 billion US$; experience teaches that the first estimated costs of such big infrastructure projects frequently double over the time until completion. The height of the dam will be 49m with a water depth of 32m, a surface area of 49km2 and a volume of 0.225 km3; the length of the dam will stretch over 810m. The spillway capacity reaches up to 3,980 m3/s with a maximal capacity of the production of 1,260 MW. The catchment area of the site covers 272,000 km2. 95% of the produced energy would be exported to Thailand. There are realistic doubts about the long-term functionality of the dam. The reservoir could be filled with silt, as other examples (the Mun dam in Thailand, built in the 1990s) show. International Rivers, an American NGO, states, that 2,100 people have to be resettled, more than 202,000 people in the dam's area would suffer disadvantages due to losses of agricultural land, riverbank gardens, worsened access to forest recources and impossibility of gold panning. Meanwhile, local villagers living along the river voiced concern that the dam construction should not affect their original livelihood. A villager, who did not want to be named and lives near the Xayaburi site, said he had not been given much information about the impact of the dam. He said staff from a Thai construction company had surveyed the site and asked the villagers to move to another location. The villagers were told that the company will build their houses at another location and will also construct road, provide water supply and electricity. Additionally, villagers who own teak farms will be paid 150,000 kip ($19) per teak as compensation. The villagers were also worried that the construction of the dam might affect fisheries and fish migration in the Mekong River. A villager said the company staff had told them that they will build a fish ladder. Additionally, the company's staff also told them that they will build a special channel to facilitate passage for boats. This village is more than 150 years old, with most of the villagers making their money from fish harvesting and agricultural plantation. "We will not move to the other location until the construction of our new houses are finished," a 50-year-old villager said. Another 47-year-old villager said he does not want to move to the other location due to sentimental attachment for the present village. He said his village was located near the Mekong River and he could harvest fish to earn his livelihood. If he moves to the other location, he is not sure what he could do to earn his livelihood. About 780 people live in his village. All of them have to move to the other location when the dam construction starts. Most of the villagers in his village are farmers and fishermen. In October 2009 there was a campaign, reaching 23,000 signatures to the prime ministers of Laos, Thailand, Cambodia and Vietnam. The petition was for keeping the whole lower Mekong free of dams at all. 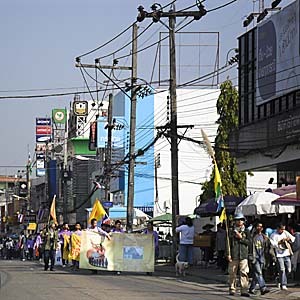 In September 2010, another campaign from 24,000 people from northeast and north Thailand, submitted a petition to Thailand's prime minister Abhisit Vijjajiva in demand to cancel the Sanyabury dam. World Wildilfe Fund, World Fish Centre, United Nations Food and Agriculture Organisation (FAO) criticised the Environmental Impact Assessment (EIA), initiated by the Laotion government and carried out by the Thai TEAM consultant Cie, were 'woefully inadequate' and were far below international standards for such studies. The review finds the proposed fish passes for the dam ignore design guidelines, lack critical detail including any specification of target. Fish passes in Europe and North America worked partially out their purposes, but there are completely different kinds of fish living. In these northern countries the fish passes are designed mostly for salmons and other kind of fish, who are much more able to jump over distances. The Mekong species fail to jump over barriers. WWF fears a much larger scale repeat of the environmental damage of the dam on the Mun River in Thailand, a key Mekong tributary. After similar bland assurances of only low level impacts on fisheries prior to construction, the first decade of the dam's operation saw damaging impacts on 85 per cent of fish species present before the dam's construction, with 56 species disappearing entirely and reduced catches for a further 169 species, according to a World Commission on Dams study. But not only that. The Mun river dam in Thailand is a perfect example for a failure of official predictions and assurances. The productivity of the Mun river dam fell down to only fourty percent after the first few years in operation, due to silt sedimentation. Even the expectations of the investors were disappointed. Instead of an annual profit of 12% they gain only 5%. ...fundamentally undermine the abundance, productivity and diversity of the Mekong fish resources . With all the consequences for the diet of about 65 million people living from the river's fish abundance and the irrigation of agricultural land only possible due to the river's flow as it is now. The future scenario is of the Mekong ceasing to be a bounteous source of fish and guarantor of agricultural richness, with the great river below China becoming little more than a series of unproductive lakes. The dam would block a fish migration route of alone 23 certain fish species that travel from Tonle Sap Lake in Cambodia - near the famous Angkor sight at Siem Reap - riverupwards passing over the site of the planned dam. World Fish Centre and scientists from around the world agree that there is no possible mitigation technology to deal with the problem. All the areas downstream the dam would suffer the alternation of water flows, silt and nutrients of an ecological system which is running since tenthousands of years. That alone means a huge impact for nature, fishery, rice production and agriculture in general and the national economies of the concerned countries. Although the Mekong River Commission members are obliged to announce such planned infrastructure projects on the Mekong to the other members, Laos can still legally build the dam, despite the disagreements of the other members and their concerns. The legal agreement of the Mekong River Commission (MRC) does not put any sanctions on a member state hurting the agreements. The MRC is a toothless tiger. Civil rights movements and affected communities have also no legal rights to oppose the project. It's rather to fear that resistance against a resettlement would be broken by police or military forces. In Laos alone are many precedences for brutal military actions against locals who lived in areas who are desired by rich investors. Although there are tensions among the littoral states about the project, Cambodias primeminister Hun Sen gave a statement that environmental groups must not be "too extreme" and defended the right of Lower Mekong countries to build dams on the river. Cambodia is itself planning three dams on the Mekong. Since the Sanyabury dam is a precedent for all the other dams, dozens in total, it's fulfilling would trigger a serial of other dam projects, destroying the natural habitats of the Mekong thoroughly and forever. On December 8th 2011 the Mekong River Commission (MRC) came to an agreement to postpone the construction of the Sanyabury dam. The communique is that there has to be more research with regard to the impact and sustainability of the project. There are sharp divisions between the four member states of the MRC, Laos, Thailand, Cambodia and Vietnam, concerning the dam project(s). There seemed to be big pressure on little Laos. But also China plays an influential role; it is supporting Laos. That certainly encourages Laos to oppose Vietnams politics to cancel the dam(s) construction. Vietnam is calling for a ten years moratorium for all dams on the lower Mekong. There is a high probability that the economic expectations are estimated to optimistic, and problems are understated. Particularly the costs of environmental impacts are understated. These are costs who come up in the future and have to be payed - draughts, floods, losses of nutrients for the agriculture. Nevertheless, it wasn't clear if the building site near Sanyabury was cleared of equipment or not. Factually it turned out that the dam construction went on. On April 5th, 2014, the Second Mekong River Commission Summit was held in Ho Chi Minh City (Saigon), with participation of the prime ministers of the four full-member states. Again a committment for the 'sustainable use of the Mekong River' was officially done. But what does that mean factually? While International Rivers is pleased that Mekong leaders recognize the negative environmental and social impacts that hydropower development poses to the mainstream, we are disappointed that leaders did not condemn the current rush of dam building on the Mekong mainstream. The ability to make informed decisions, based on sound data and scientific study, should be a prerequisite for starting deliberations over whether to build dams on the Mekong River mainstream. Words without actions are meaningless; the Lao government must stop its free reign of Mekong mainstream dam building. We expect all construction on the Xayaburi and Don Sahong dams to end immediately and that no further decisions or actions be taken until the Mekong River Commission Council Study, Vietnam’s Delta Study, and transboundary impact assessments for each project have been completed and the results have been comprehensively reviewed. Since 2009 ten thousands of people mostly in Thailand, Cambodia and Laos signed petitions to the prime ministers of the littoral states to stop all the dam building activities. Since the Sanyabury dam would be the first dam built on the lower Mekong River it's significance lies not only in the very impact it will have on the river's ecology, but also in the precedence it would give at least to all the other eleven or more dams, whose plans are already in the drawer. The huge consequences are described above: The extinction of many species, the end of food abundance in fisheries and agriculture. Some 65 million people would be deprived of their food origins, with all the sources of income connected to fishing and agriculture. And there is no alternative for them. On the contrary: the populations who live from the river are rapidly growing. The next step would be further empoverishment of masses of people, waves of migration, conflicts. The river passes through six countries. Some of them have had bloody conflicts in the past and even in the present. Therefore a relentless management of the river could trigger serious crisis of food and water shortages, prolonged floods and droughts and maybe even armed conflicts in mid or long term. Concerning is also the political situation in all the littorial countries. Freedom of speech and publishing is not given. That means a great barrier for informing people about what's going on and how serious the impacts of political plans can be for them. Brave publishers always risk fines, imprisonment and other restrictions when informing the public. Not seldom they get brutally hurt or killed for their publications. Taking part on a demonstration is risky, attendees might have to face disadvantages, imprisonment or open violence. The most influencial opposition is coming from Vietnam and Cambodia, partially from Thailand also. That is because there are big industries endangered. Not only the huge fishing industries along the river. Considered that Thailand is still the largest rice exporter in the world, and most of Thailand's rice fields are situated in the northeastern plains of the country, neighbouring the Mekong River, the dam(s) would cause a huge impact on these industries. A similar situation is given in Vietnam, where are no dams planned, but what would have to suffer all the consequences of the upstream dams. The Mekong Delta is the most fertile and productive agricultural region in Vietnam. It already suffers problems of salt intrusion and draughts, probably because of China's water politics at the upper Mekong (Lancang). But that's only the beginning. That's why Vietnam is the biggest opponent of the dams. A striking observation on the research for this article was that there is not only much critics on the dam project, what is appreciated by the author, but no consideration of the socioeconomic background of the project. Big money is playing here, on the search for investment. That's part of what is called the 'real economy', in contrast to the 'virtual economy' of the stock exchanges. It's about electricity, energy in general. Doubtlessly, we all need a certain supply of energy, that makes the difference in living today and how was life in the past. But, how much energy do we really need? 95% of the produced electricity of the planned Sanyabury dam is supposed to be exported to Thailands booming industries. There is no critics about that. The industries produce a lot of cheap, useless consumer goods, ending up rather earlier than later as dump. Polluting the nature manifold: producing energy, exploiting natural resources, producing consumer goods in factories, all the transport what is necessary to carry raw materials and final products to their destinations, and finally it ends up on the waste disposal site, or, how it is frequently the case in the Southeast Asian countries, in the nature directly. The central question is rather why we don't save energy and resources in general. There is no doubt that there are great potentials to save energy everywhere, and a civilized society could come along with much less than it is consuming now. But this question is almost never asked. Asking this question would mean to question the whole modern global society and how it is constituted. It's not sustainable. Modern society is based on money, debt, profit, interest rates, inflation, competition and growth. Economies must grow, otherwise they fall back. Laos is a poor, weak, small country very much back in time. A journey through Laos gives a traveller impressions from long forgotten times. The people are poor and live very simple. Laos' only chance to develop in this global socioeconomic system is to exploit it's natural resources. It must attract foreign investment (e.g. from China and Thailand), because it hasn't even itself neither the financial means nor the technical know-how for any bigger infrastructure projects. So, the little country is going to be sold out to it's rich neighbours, respectively global companies. As a state it has no alternative to follow this path of development. A state is, at the end, itself nothing more than a business company. An automatized subject. Criticising the dam is necessary. No more dam should be build on the whole river, including China. The already existing Chinese dams should be dismantled. But one mustn't be ignorant about the socialeconomic context. States have no alternative than to take part in the race for development. It's the system, stupid! Another significant aspect is the fact, that in a free market economy energy is competing with food. The global socioeconomic system is not a system for distributing necessary goods and services for the needs of the people. We have the same conflict since long in Indonesia, Malaysia, Thailand and other equatorial countries, where on large scales of agricultural acreage not food is cultivated but palm oil. It's a system in which the highest profit counts. That means in practice: if an investment in cluster bombs is more profitable than an investment in candies, money will go into the production of cluster bombs. If an investment in energy is more profitable than an investment in food, energy is prefered. Profit over people. There is much concern about the extincion of fish which is important for human nutrition. That's a real and deep concern. It's also an economic factor, and that's always the argument when it comes to negotiations. But there will be many more species extinct than edible fish. More creatures are living in and from the river, in the water, as birds, mammals, insects, plants in great variety. They seem forgotten. The Mekong River is a fascinating river, because he is still over long stretches quite untouched. That's rare today. The touristic boat tour from Houayxay/Chiang Khong to Luang Prabang lasts one to two days. The boat is passing all the time green, remote areas. No big road is to see there, no city, no big traffic, no transmission lines. Here and there a hamlet, that's it. There is still space left for vulnerable animals and plants. That's a value also, I think. You can get a lively impression of the passage from Houayxay to Luang Prabang when watching the video 'On the Mekong'. The movie was made in July 2011; meanwhile the urbanization process along the river has made considerable advances. The impact of the dams in China is already huge. But, China is a strong country, an emerging powerful economy. No other country is in the condition to set much pressure on China's leaders for decisions of how to 'develop' this country. China is a one-party dictatorship. The ruling party does not allow any opposition. Opponents against the 'Three Gorges Dam' in China suffered nasty penalties. It's a very difficult situation there for any opposition. The situation in Laos is different. Laos is very much depending on the surrounding countries, also Vietnam. Pressure from this side seems to be the biggest hope at the moment to cancel the project. But, first, there will not be enough pressure and second, Laos get's much support from the big investors who hope to profit from the construction. It's pretty sure that the Sanyabury dam and many, many others will be built. On October 3rd 2013 the Laotian government notified the Mekong River Commission (MRC) of a planned dam at Don Sahong. Don Sahong is an island in the 4000 Islands landscape on southern Laos, situated 1,5km north of the border to Cambodia. Plans of the dam date back at least to 2006; the construction was planned to start a month after the notification, in November 2013. This proceeding is not in conclusion with MRC agreements, who state that a planned mainstream dam on the Mekong River has to be consulted with the neighbouring countries to reach a consensus. The Laotian government claims that the dam is only planned on a Mekong channel (Hou Sahong), not the whole river, and the matter is therefore not part of the agreement. 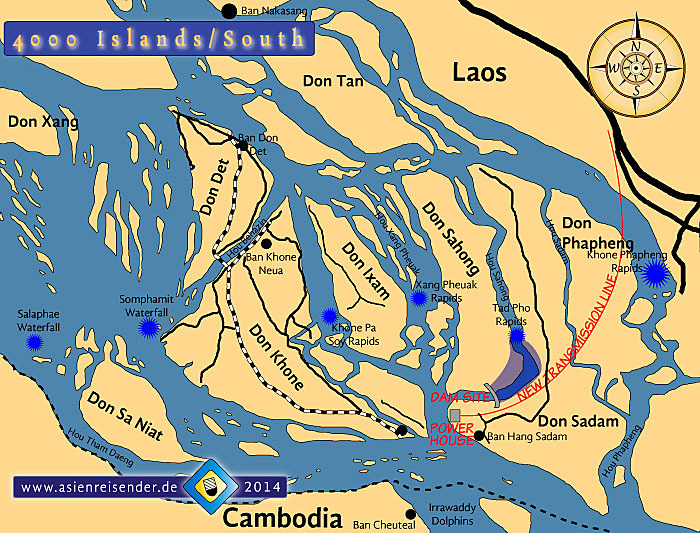 The new dam between the two islands of Don Sahong and Don Sadam will block a very critical channel. It's crucial for a number of migratory fish species over the whole year. 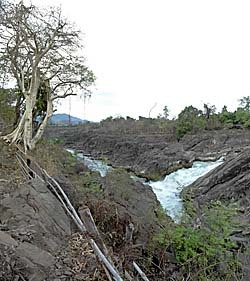 The Mekong River's landscape at Don Sahong is coined by the Mekong Falls (Khone Falls), consisting of six waterfalls and a number of channels. The Hou Sahong channel is the only channel migratory fish can use to overcome the falls in dry season and partially all over the year. Blocking this bottleneck is fatal for the fish populations. The dam construction would include massive rock blasting, heavy industrial activities around the site and alterations of the river's flow. The developers, though, claim that there wouldn't be a serious impact on the river's ecology. Other channels could be cleared of fish traps and deepened to give migratory fish an alternative. Environmental groups, scientists and even government representatives from Thailand, Vietnam and Cambodia don't believe that there is a replacement for the Hou Sahong migration route. In past years the developers have made polls among the local population if they would appreciate the construction of such a dam. 60% of the people agreed with the planned construction. Though, that is certainly no believable outcome. Free speech is not given in Laos; the free uttering of oppositional ideas is dangerous and led many brave or unaware Laotions into great problems - up to imprisonment or 'disappearance'. The dam would severly damage the local fisheries, one of the main sources of income for many of the local people around. It is supposed also to impair the local tourist industries. Besides were the local people given misleading information about the dam and it's impact, as Milton Osborne and 'International Rivers' write. Fish ladders and alternative migration channels would be provided. We know that these installations don't work for the Mekong fish. The productivity of the fisheries will decrease. The extinction of a number of migratory fish will also trigger problems for other species who live from these fish. Among them are the rare Irrawaddy Dolphins who live shortly south of the Mekong Falls. A productivity of 260 MW, what is not much for a dam and brings relatively little profit, is an unproportional threat for the river. The Don Sahong dam would be more than 30m high. The produced electricity is planned to be exported to neighbouring Thailand and Cambodia. The construction company is 'Mega First Corporation Berhad' (70% share) from Malaysia, together with 'IJM Corporation' (30% share). The site of the new dam on crucial Hou Sahong channel. Nearby are the tourist islands of Don Khone and Don Det. In November 2016, the Laotian government informed the Mekong River Commission (MRC) about it's plan to build a third dam at the main Mekong River near Ban Pak Beng. The construction of this 913 megawatt hydroelectic dam will, according to an article in 'The Diplomat', start in July 2017. The surrounding of the new dam is mountainous terrain, still by greater parts covered with tropical rainforest in Oudomxay Province. The local people live from fishing, livestock and what they get out of the jungle. International Rivers claims that about 6,700 people will be displaced for the new megaproject, alltogether 25 villages. Behind it are, as to expect, powerful corporations like the Thai Electricity Generating Holding Public Co. Ltd, backed by the governments of Laos and Thailand. The continuous ambition of the shady Laotian government to proceed with the desastrous dam-building policy shows that the country's new president, Bounnhang Vorachith, follows the footsteps of his unscrupulous predecessors. And that's certainly why he is president - someone more responsible wouldn't get the job. Laos is planning at least eleven more Mekong dams, together with a large number of more grand projects to rapidly develop the small country, respectively filling the pockets of the ruling functionaries. 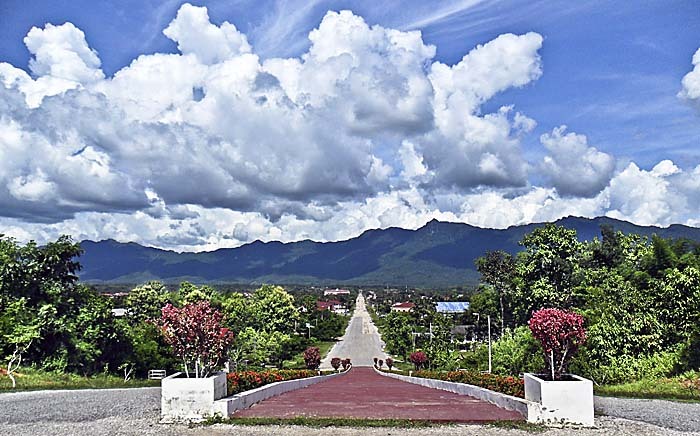 That includes the new railroad connection between Vientiane and the Chinese border which will link to Kunming in Yunnan, and via Chiang Khong to Chiang Rai and Chiang Mai in Thailand as well. More railways are planned, big roads, river bridges, tunnels through the northern mountains, airports and so on.